Sunday July 14 1907 There was heavy rain early this evening. We did not have breakfast till eight oclock. I did some house-work and put some things in order. After dinner I read the papers and wrote some, among other things a letter to Mary Briggs. Did evening work and sat on the porch till bed time. Monday July 15 1907 It was raining this morning. I had churning done and baked cookies. After dinner Billy helped me wash the clothes were all day by six oclock. Did evening work and went to bed early. 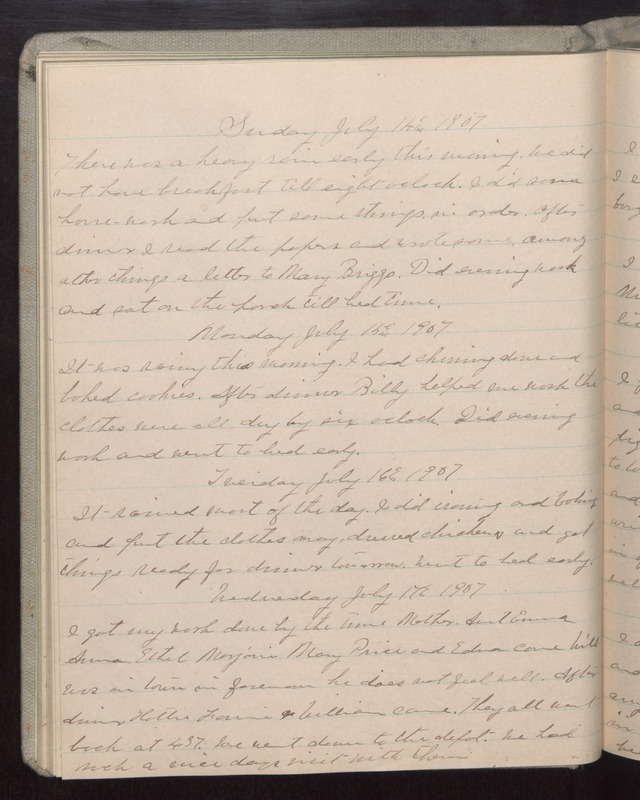 Tuesday July 16 1907 It rained most of the day. I did ironing and baking and put the clothes away, dressed chickens and got things ready for dinner tomorrow. Went to bed early. Wednesday July 17 1907 I got my work done by the time Mother, Aunt Emma Aunt Ethel Marjorie Mary Price and Edna came Will was in town in forenoon. He does not feel well. After dinner Hattie Fannie & William came. They all went back at 4.37. We went down to the depot. We had such a nice days visit with them.